What type of fire sprinkler heads will you choose? Whether you are updating your old sprinkler system or building a new facility, your fire sprinkler system is going to need some new sprinkler heads. While there are three different sprinkler heads for you to choose from, each of these sprinkler heads is different and should be chosen with care. To understand each of these sprinkler heads, it is important to understand how they work in general and the different features of each head. Read on to find out your options for new fire sprinkler heads for your facility. A typical sprinkler head consists of many different components, including a plug, a glass ampule or another triggering mechanism, a deflector, a cap, and the frame. When your fire sprinkler system is triggered, the heat activates the triggering mechanism where a glycerin-based liquid expands and breaks the glass ampule. Once broken, the plug is forced out of the sprinkler head by the pressurized water and the water is released. As the water flows out of the cap, it hits the deflector plate and disperses around the room to extinguish the fire. There are three different types of fire sprinkler heads for you to choose from. Each of these sprinkler heads has a different placement in your facility and should be considered carefully. Let’s take a look at each of these sprinkler heads. Pendant heads are the most common sprinkler heads. These heads allow for maximum coverage as they extend from the ceiling, covering the entire room. When activated, these heads spray a stream of water onto the deflector and allows water to spray around the room. Upright sprinkler heads sit on top of your sprinkler system pipes and spray water upward. Although it looks like a pendant head, this sprinkler head should not be placed downward. Sidewall sprinkler heads are often used to protect small rooms or hallways. Sidewall heads have a fan-shaped deflector in order to disperse water around the area below. These sprinkler heads are generally used in areas that are not large enough for traditional sprinkler heads but that still needs fire protection. 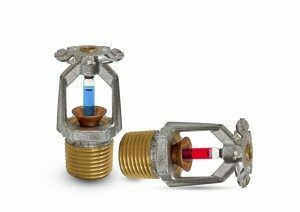 When choosing your fire sprinkler systems, it is important for you to choose the right sprinkler heads. For more information on choosing a new fire sprinkler system for your facility, call Anderson Fire Protection, Inc. today! Fire Alarm Inspections with Anderson Fire Protection Inc. This entry was posted on Friday, September 9th, 2016 at 3:14 pm. Both comments and pings are currently closed.